Home Outfit Orange & Black In The Summer? Today was a special day because I spent my afternoon visiting my great-aunt. I cannot wait to share with you how I spent my afternoon but before I do I wanted to show you how you can wear orange and black in the summer. Orange and Black are usually correlated with Halloween and the Fall. But if the shade of orange is a bit brighter and more vibrant than the shades seen typically in the Fall then it is most definitely possible! On my visit with my aunt I wore my eShakti black skirt and a Boden top. What I adore about this outfit is that the shade of this orange is bright enough to remind me of the freshness and heat of the summer without feeling too Halloweeny. 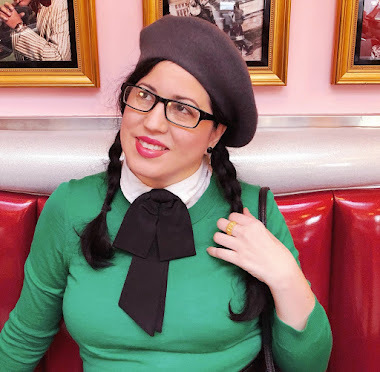 And I have to say the blouse was thin enough to feel cool in and so soft against the skin that I felt incredibly comfortable wearing it as well as my EShakti skirt. I added some authentic vintage elements like a pair of 1940's orange hoop clip on earrings, a few of my Moonglow bracelets, and a flower in my hair and whala! Orange and Black in the summer without looking like a Halloween poster child and a dash of vintage! It doesn't take a lot to create an outfit that has a vintage feel to it. Accessories and hairstyles add a huge portion to any look you want to create. Don't hesitate in experimenting with colors or pieces in your closet because you just may create wonderful looks for yourself. If you like this top by Boden you can find it HERE. I find a lot of my Boden pieces via Ebay at more than half of the price than on their online store but they do have heaps of sales going on all the time. There pieces are so beautifully made and worth every penny! Do you like experimenting with colors? What is your favorite color combination when it comes to creating an outfit? I think this outfit turned out real nice. I'm not into orange. I don't think it flatters me. I have dark hair, blue eyes and for some reason tend to stay away from orange and brown both. I like pink and black. (not very original, I know). LOL It looks great on you. You look fantastic! I think - just a personal theory - that it's easier for brunettes to wear orange + black together without it necessarily looking overtly Halloweeny. On me, such is rarely the case unless the outfit is almost all black with a hint of orange or vice versa (my ginger locks seem to up the All Hallows Eve factor), so I usually partner orange with brown, navy, grey, beige, or denim blue unless it's fall.